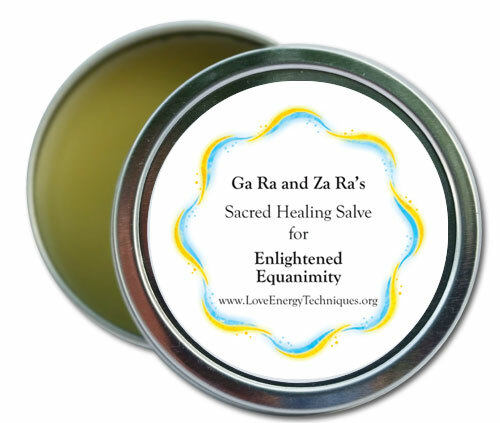 Our Sacred Healing Salve for Enlightened Equanimity is made from a recipe found in an ancient 2,700 year old document. This ancient Love Energized formula uses a sacred secret combination of several Philosopher’s Stones and 7 ancient Love Energized Ceremonies where ancient Love Energized Mantras are repeated and a series of ancient Love Energized words are used to energetically infuse Teraphim Unity Consciousness level Healing Energies of Unconditional Love directly into natural ingredients. Each Sacred Healing Salve for Enlightened Equanimity, (when applied to one’s 3rd Eye Spiritual Energy Center while repeating ancient Love Energized mantras, after saying the words of an ancient power prayer), enables one to attain emotional equanimity and temporarily enter the state of Conscious Awareness that people call Enlightenment. Our Sacred Healing Salves for Enlightened Equanimity remove stress, reduce menstrual cycle discomfort, and energize those with Chronic Fatigue Syndrome, while also helping people overcome grief from the loss of a loved one, and enabling one to resolve life’s emotionally charged events.